The consolidation of four cases asserting design defect and failure to warn claims against the manufacturer of a medical device surgically implanted to treat stress urinary incontinence was not an abuse of discretion by a federal district court in West Virginia, the U.S. Court of Appeals for the Fourth Circuit ruled, affirming the lower court’s action. Each case was part of a multidistrict litigation involving over twenty-five thousand lawsuits. In a consolidated trial of the four cases, the jury returned verdicts for the plaintiffs, awarding over $4 million to each. In addition to upholding consolidation, the appellate court rejected objections to the trial court’s evidentiary rulings, a claim that there was insufficient evidence to support the verdicts, and a challenge to one of the jury instructions (Campbell v. Boston Scientific Corp., February 6, 2018, Wilkinson, J.). Boston Scientific Corporation manufactured a transvaginal mesh prescription medical device called the Obtryx™ Transobturator Mid-Urethral Sling System, which was designed to be permanently implanted as a treatment for severe stress urinary incontinence. The Food and Drug Administration (FDA) approved the device under the 510(k) process for medical device approval. Each of four women who had received such an implant, and who had allegedly experienced severe complications as a result, filed separate lawsuits against the manufacturer. Prior to these individual cases being filed, the Judicial Panel on Multidistrict Litigation had created an MDL, which was still pending in the Southern District of West Virginia at the time that the individual suits were initiated. Therefore, the plaintiffs filed their separate cases directly in this MDL, and each sought compensatory and punitive damages based on theories of negligence and strict liability for both design defects and failure to warn. The district court consolidated eleven cases for trial under Federal Rule of Civil Procedure 42, of which six were dismissed and one removed from the action prior to trial. The jury returned verdicts for the plaintiffs, awarding over $4 million to each. After trial, the manufacturer reached settlements with two of the plaintiffs and appealed the judgments in favor of the remaining two plaintiffs, asserting that the consolidation rendered the trial unfair, disputing two evidentiary rulings, claiming insufficient evidence to support the verdicts, and challenging one of the jury instructions. Consolidation. The Fourth Circuit found that the district court had appropriately considered the relevant statutory factors in its decision to order consolidation, specifically noting that common questions of fact and law had formed a substantial part of each suit and that the lower court had "bent over backwards to ensure that distinct questions of fact and law could be appropriately developed at trial and distinguished by the jury." Furthermore, the appellate court declared that "[t]o hold otherwise would be to sacrifice the substantial savings of time and money that consolidation offers." Evidentiary rulings. Relying on its prior rulings in Cisson v. C.R. 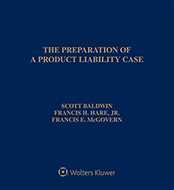 Bard, Inc. [see Products Liability Law Daily’s January 15, 2016 analysis] and Huskey v. Ethicon, Inc. [Products Liability Law Daily’s January 27, 2017 analysis], the Fourth Circuit found that the district court had acted within its discretion when it excluded evidence of the FDA’s 510(k) approval of the implant and when it permitted evidence of the manufacturer’s warning on the Material Safety Data Sheet (MSDS). The trial court dismissed the manufacturer’s challenge that these cases had "fail[ed] to address the distinction between 510(k) clearance based on a predicate device that was grandfathered in when the process was created and clearance based on a predicate device that itself received a thorough safety evaluation." Admitting evidence on these grounds would "invite a battle of the experts regarding the exact meaning of 510(k) approval in these circumstances" and would risk jury confusion, the trial court reasoned. With regard to the MSDS Caution evidence, the appellate court found that it was not hearsay, because it had not been admitted for its truth but to demonstrate that the manufacturer had notification of potential safety concerns. In the context of the failure-to-warn claim, the court noted that the patients had not relied on the MSDS evidence to establish that there were risks from the implant and that those risks injured them but, rather, had used the evidence to demonstrate that the manufacturer "reasonably could have provided the relevant information to physicians." Sufficiency of evidence. The appellate court rejected the manufacturer’s argument that the evidence was insufficient because it did not establish a specific design flaw, did not establish that the device differed from other polypropylene mesh slings, and did not provide evidence of a safer alternative design. The court found that the evidence identified several aspects of the product’s design that allegedly contributed to its dangers. The court also noted that although the manufacturer might dispute that any of these were "defects," the jury was entitled to conclude otherwise based on the evidence presented. Similarly, there was no requirement to demonstrate that the device was different from other polypropylene mesh slings, and even if such a showing was required, the record did indicate that the device in question was made from Marlex polypropylene, which had an MSDS Caution against permanent implantation. Thus, at minimum, the jury could have seen this as a difference in considering what a reasonable manufacturer would have done. Finally, the court found that the trial record did include evidence of safer alternatives. The court added that there was no plain error which would trigger consideration of an argument raised for the first time on appeal. Failure to warn. The appellate court rejected the manufacturer’s argument that expert testimony on this claim was required as a matter of West Virginia law. It also rejected the contention that the adequacy of a manufacturer’s warnings to physicians for a medical device was not within the "common knowledge and experience of a lay juror." Although the court noted that expert testimony on the adequacy of the instructions may well have been helpful, that did not mean that it was required. The court concluded that a jury could reasonably find, based on the record, that the Obtryx’s instructions were inadequate. Jury instruction regarding punitive damages standard of proof. The appellate court affirmed the punitive damages awards ($1 million each), finding that the district court’s instruction had been a correct statement of West Virginia law at the time of the trial. Although the West Virginia legislature subsequently passed a statute establishing that punitive damages were to be awarded only on the basis of clear and convincing evidence, this statute was not in effect at the time of the trial. The case is No. 16-2279. Attorneys: Anthony J. Majestro (Powell & Majestro, PLLC) for Carol Sue Campbell. Robert T. Adams (Shook, Hardy & Bacon LLP) and Michael Bonasso (Flaherty, Sensabaugh & Bonasso, PLLC) for Boston Scientific Corp.